In a recent issue of Foreign Affairs Nick Danforth likens the caliphate to an abstract concept such as the “dictatorship of the proletariat” that has very little historical basis and is largely made up as different leaders need the concept. Danforth calls the caliphate a fantasy that has been exploited by political and military leaders in order to strengthen their claim to Islamic leadership. Westerners have confused the dream of a unifying religious power, a caliphate, with a cruder military and economic power claiming religious authority. After Mohammed died in 632 there was no heir to his leadership and the conflict about who should succeed him began. The word caliph means succession and the caliphate is a governing body that manages political and religious affairs of state. 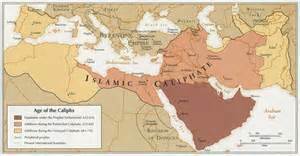 You can begin to read more about the caliphate here. The distinction between Shia and Sunni has its roots in the competition for leadership after Mohammed. Some believe that his son-in-law Ali should serve as leader and he was the rightful heir and they became “Shia.” Those who believe that Mohammed supporters and the people around him were eligible for leadership are the Sunni. The caliphate is in the tradition of messianic Islam where at some point at the end of times the souls of all Muslims will join Allah. This resurrection is related to the Christian resurrection, but one difference is the restoration of the caliphate. Supposedly, an Islamic state under sharia law will be governed by a Caliph who has authority over all Muslims. The true caliphate will come after unjust kingdoms are destroyed. But the caliphate has never been much of a governing organization and there are controversies over whether Islamic law is part of the state or not. But the notion of the caliphate has been used to exploit Muslim claims of control of their own rights and the rights of other Muslims. The caliphate is also used as justification for eliminating the borders that Europeans drew between countries and arguing for a transnational Muslim empire. ISIS is trying to create a pan- Islamic moral order that does not recognize national boundaries. The idea of a caliphate is of course consistent with the Empire mentality of ISIS and their desire to speak with one voice. The presence of a caliphate is threatening to more secular democratic interests and for this reason the notion of a caliphate was outlawed by Ataturk. But Muslim societies are assumed to be fractionated at the moment and not held together by any common authorative source. The idea of a caliphate is pleasing to many and is viewed as a binding and coherent structure that keeps Muslims together. Osama bin Laden was attracted to the idea of a caliphate as one way to redress the humiliations and grievances heaped on Islam. Finally, Danforth concludes that it would be a mistake to think that the idea of reviving the caliphate is anything but a power move with no basis in clear Islamic principles. The Syrians, Turks, Iraqis, Afghanis etc. are surely bound together by Islam but also represent political and cultural historical differences that would be obliterated by a pan- Islamic power organization called the caliphate. Westerners should not be duped into believing that the caliphate holds Islamic legitimacy; rather, it might slip easily into an unpleasant dominating authoritarian force. Posted on December 14, 2015, in Communication and Conflict Resolution. Bookmark the permalink. Comments Off on The Caliphate is a Myth.